Critics of Kansas' science standards worried that if conservatives retained the board's majority, it would lead to attempts in other states to copy the Kansas standards. "There are people around the country who would like to see the Kansas standards in their own states," said Eugenie Scott, director of the National Center for Science Education in Oakland, Calif., which supports the teaching of evolution. Also Tuesday, Kansas Republicans chose a nominee to challenge Democratic Gov. Kathleen Sebelius in November. With 96 percent of the state's precincts reporting, state Sen. Jim Barnett captured his party's nomination with 36 percent of the vote, besting six other candidates. Control of the school board has slipped into, out of and back into conservative Republicans' hands since 1998, resulting in anti-evolution standards in 1999, evolution-friendly ones in 2001 and anti-evolution ones again last year. Late-night comedians have been making cracks about Kansas, portraying it as backward and ignorant. Comedy Central's "The Daily Show" broadcast a four-part series titled, "Evolution Schmevolution." The school board contest was part of a larger effort by the intelligent design movement to introduce its ideas in public schools. A suburban Atlanta school district is locked in a legal dispute over its putting stickers in 35,000 biology textbooks declaring evolution "a theory, not a fact." Last year, in Dover, Pa., voters ousted school board members who had required the biology curriculum to include mention of intelligent design. 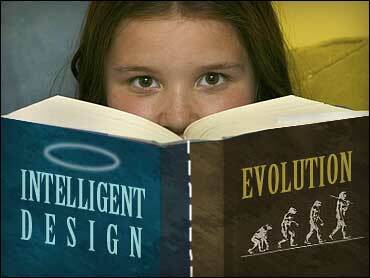 A federal judge struck down the policy, declaring intelligent design is religion in disguise. A poll by six news organizations last year suggested about half of Kansans thought evolution should be taught alongside intelligent design. Proponents of Kansas' latest standards contend they encourage open discussion. "Students need to have an accurate assessment of the state of the facts in regard to Darwin's theory," said John West, a vice president for the Center for Science and Culture at the Seattle-based, anti-evolution Discovery Institute. The standards say that the evolutionary theory that all life had a common origin has been challenged by fossils and molecular biology. And they say there is controversy over whether changes over time in one species can lead to a new species. Three incumbent conservatives faced primary foes Tuesday, and there was a contested GOP race for the seat held by a retiring conservative. A pro-evolution Democratic incumbent also had a challenger. With almost all the votes counted early Wednesday, pro-evolution Republican Jana Shaver picked off a conservative incumbent and won the primary for the open seat. Conservative Republican John Bacon kept his seat by besting two pro-evolution challengers, as did another conservative incumbent, Ken Willard. Janet Waugh, a Kansas City Democrat who opposed the new standards, easily defeated a more conservative Democrat who favored the anti-evolution language.